It’s finally autumn in Kansas. The nights are chilly, and the days can’t decide between chilly and warm. The skies are a mesmerizing deep blue. The trees are changing. The gnats are swarming (sort of ruins the picture, doesn’t it? ), and the year is ticking to a slow close. With the harvest going on all around me, my thoughts naturally have turned back to Late Harvest, an embroidery project that I started eons ago and that’s finally ticking to a close, too. When last we looked at this project, the right side was completely finished and I had finished most of the stitching on the left side. I still had one large leaf and two small flowers to work, along with all the beadwork on the stems and the leaves. Well, the other day, I put my fingers to it and got down to work on the last stitching on Late Harvest, and here are the results. 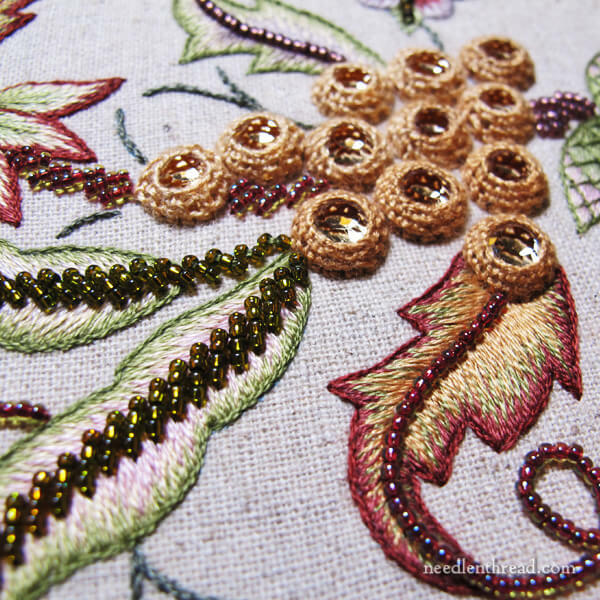 Here’s the completed left side of Late Harvest, aside from a tiny bit of filler stitching between the bead lines on the stems, which I’ll get to when I move to the next and final stage. 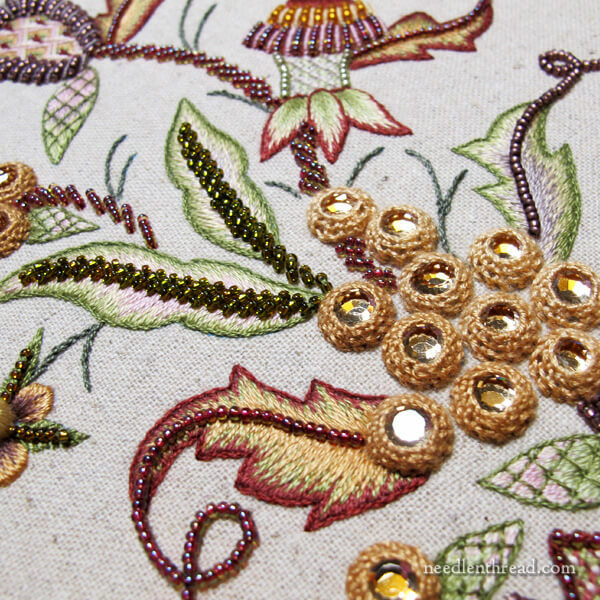 My favorite part of the left side of the overall design is this section right here, where the big bunch of grapes (made with flat back crystals fixed to the fabric with stitching) and all the big leaves converge. On the right side of the design, the large leaf and the large bunch of grapes are my favorite elements. Oh. Golly! Do you see what I see? I just realized right this second that I didn’t finish the right side of that large leaf! I suppose I’ll add that to the next and final stage of the project, too. I’m planning on adding filler stitches on these large leaves (between the short lines of beads) and then attaching all the stumpwork elements (embroidered a long, long time ago) all in one stitching session. I figure a few hours at most, and the project will be finished. I’ll share it when it’s done – and all the ups and downs with the stumpwork elements, too. I like to use kits designed by other folks as a carrot, because they usually don’t involve any decision-making on my part. Because of this, I find them very relaxing. I just do what I’m told and I don’t have to think about it! Once Late Harvest is finished, it’s time to set up my next carrot. I’ll be setting up a few other kits to work on during the upcoming months (or years!). One will be this Mellerstain fire screen crewel kit from The Crewel Work Company that I reviewed earlier this year. I’ll let you know the others as I decide on them. 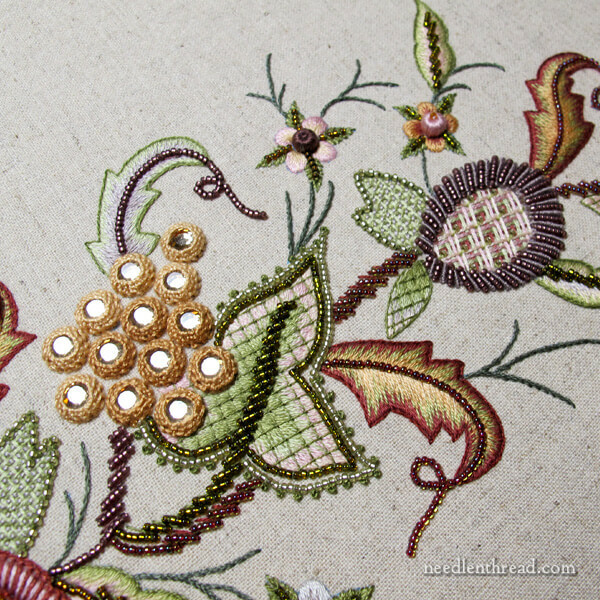 So, next phase of Late Harvest: finishing touches and stumpwork! Then it’s off to the framer! I’ll keep you posted on the finish! I look forward to your work on the fire screen. I bought the kit a while back. But I find I am having a hard time stitching with wool. Pulling the wool through to make the stitches, I find the wool threads stretch too much and become very thin. I had a kit I was working on and became to frustrated I threw it out (I am ashamed to admit). Hopefully you will have stitching tips. Your work is absolutely amazing! What patience! Mary–Fall Harvest is just beautiful. Your work is such an inspiration. It’s beautiful, I can’t wait to see the whole Late Harvest project framed and the stumpwork added, please photos. 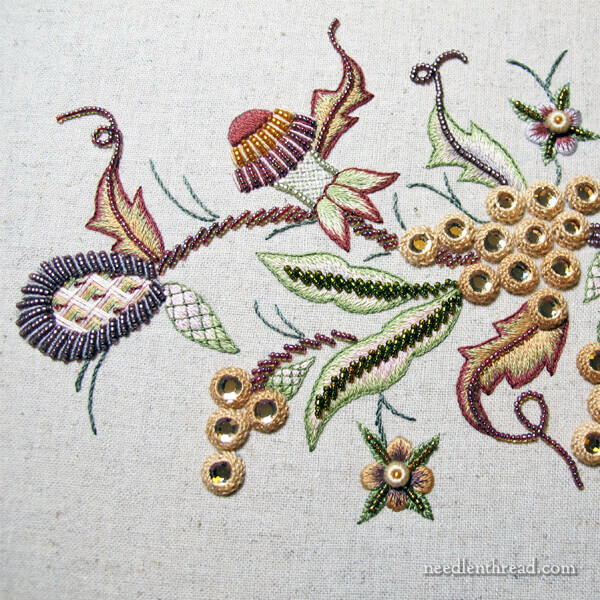 The kit looks lovely and so decorative with the beads I do like beads added to embroidery projects they make the piece stand out. I can’t wait for you to start the Mellerstain fire screen that is a huge project but a lovely design. Thanks for sharing with us the latest on the Late Harvest project and for the photos. I LOVE this project and really enjoy seeing it each time you write about it. It’s got something to it that gets to me in a needlework-fanatical sort of way! Thanks for the update and I look forward to seeing the additions. Wow! It is stunning. I love the colors and your workmanship is spectacular. I know you must be anxious to see it completed. It is such a wonderful feeling to see a project completed. While I am anxious to get the Talliaferro’s “Kashan” kit started, it arrived this week, I need to finish off at least the Laura J Perrin “Calico Stars” canvas pattern before I start it. I’ve got other projects going as well but the “Kashan” kit is definitely top notch and everything is explained in such detail that I can’t wait to get going on it. Mary, I’ve read all of the instructions and fondled the yarns. One thing I don’t quite understand is the way the yarns are labeled. For instance there are 3 Green #1’s – 1790/10, 1790/8, & 1790/6. I can’t quite tell if the 10, 8, & 6 are referring to a shade or to the thickness of the yarn. Maybe this is something you can explain to us in an article, or maybe you already have and I just don’t remember reading it. Anyway, thanks again for the wonderful kit. I just love it! I think it would be the shade, Dara. If the threads are all the same brand (like Appleton), then there wouldn’t be a difference in weight. I don’t actually have that full kit with threads – just the pattern and instructions – so I can’t see them to tell the difference, but I’m pretty sure it’s shade. Mary, this brought me back to reading through all your posts on crewel and crewel wool. I can’t find comparisons on Crewel Wool Part 2. Hi, Holly – I think Part II is really just the whole Crewel Rooster project. It’s comprised of a combination of wools all stitched in the same project. So I don’t think I actually wrote a part 2 post, per se. But maybe I did. And maybe I’m forgetting it. I will dive around and see if I can find anything else. But that was pretty much the point of the Crewel Rooster project, so I’m thinking I didn’t do a short take on it. It looks lovely! I bet it’s a very good feeling to have it so near completion. I always get excited at the end of a long project, because it means I get to start a new one soon. Happy stitching! I was just wondering about Late Harvest the other day, and if we’d get to see some more progress on it any time soon. I’m intrigued by the blue flower (blossom? bud? pod?) on the left. It looks to be a nice balance for that side of the piece. Thanks for the show and tell, Mary! I love Late Harvest. Your stitching is really beautiful. I can’t wait to see it finished. I was wondering whatever happened to the very large project with the large quantity of threads that you spoke about some time ago. I think it was to be a project that you expected to work on for a long time. Any update on it? Just curious. I love all your work. Thank you for introducing me to Trish Burr. I’m going to buy one of her kits this month as a reward to myself. I’ve been curious, before your health issue there was a massive project you were setting up involving tent stitches. I imagine it is on a back burner now, but was hoping you would be working on that soon. God bless you, Mary. Hi, Debra – I had to put that one on hold for a bit. I wasn’t 100% satisfied with the fabric, so I decided to step away from it and think about it. I haven’t gotten back to it yet, but I will eventually. This is looking wonderful, Mary. What do you plan for it when it is finished to your satisfaction? BTW, are you planning a stitch-along or similar for the Susan O’Connor chatelaine as featured in Inspirations magazine? I thought you were going to, but I could well be dreaming….. I bought the kit and would love to do it along with others. I would love the fire screen too but it was a bit much for my pocket, especially with the postage. Big oops. Apologies to Crewel Work Company, they do not charge for postage, even to Australia. Most people do however and it is very expensive as I am sure you are all aware. Hi, Christina – Yes, I do plan to work through that one on the blog. That’s one of the many I want to get going on! First, though, I must get Late Harvest out of the way. And I have to get my workroom finished. Grrrrr. Double grrrrrrr. This looks absolutely amazing! great work! !